ECG number 5: chest pain…again! A 45 year old male smoker comes with with 1 hour of moderate central chest pain. 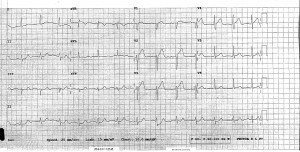 What are the key features of this ECG? The obvious feature of concern here is the concave ST elevation in the septal leads. It extends from V1 -V4 and is not associated with reciprocal changes elsewhere. This is a classic Ischaemic STE vs benign early repolarization ECG. BER would classically have <25% STE height vs TWave height, is often <2mm in total and can include other leads also. 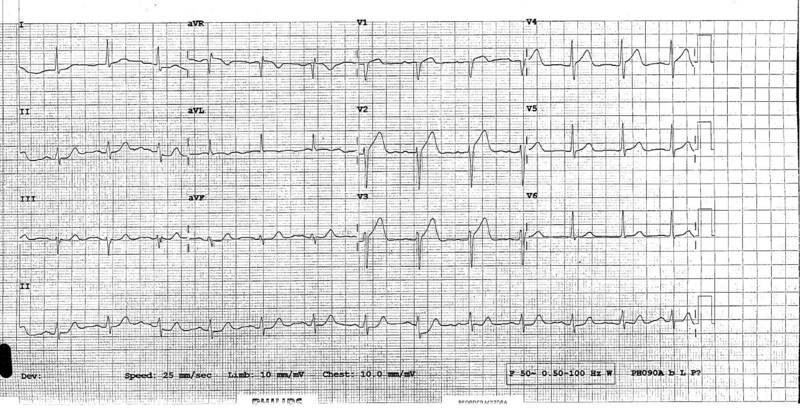 This ECG leans towards the ischaemic side of the ledger as V1 looks convex and the STE: TW ration is >25%. My preference is to call the interventionalist and discuss it ASAP. I advocate for cath if there is a good story and new change or no prior ECG. This man had an 100% prox LAD at angio.